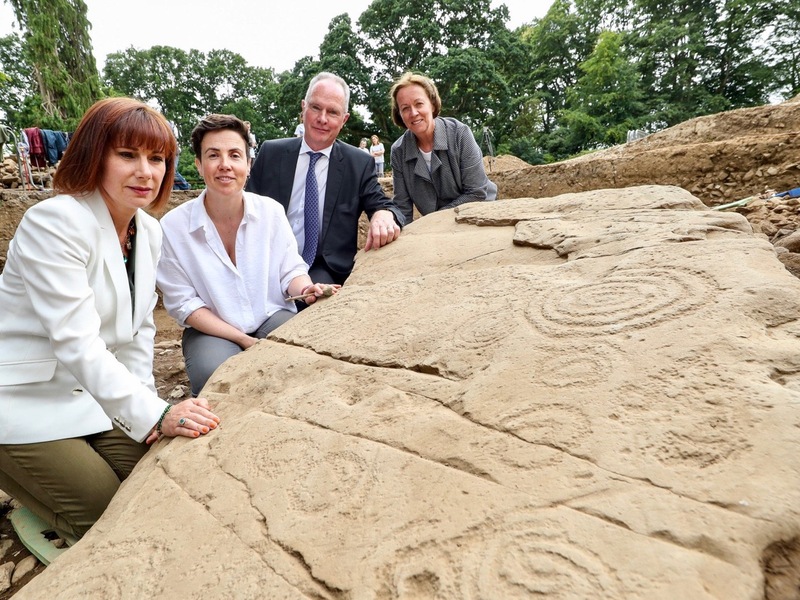 One of the many archaeological excitements in Ireland last summer was the discovery of a hitherto unknown passage grave with significant carvings beside Dowth Hall in the Bru na Boinne area of County Meath. These carvings are likely to date from around 5,500 years ago. In the picture above (courtesy of agriland.ie) from left to right are Minister for Culture, Heritage and the Gaeltacht Josepha Madigan; agri-technology company Devenish’s lead archaeologist Dr Cliodhna Ni Lionain; Devenish’s executive chairman Owen Brennan; and Professor Alice Stanton. 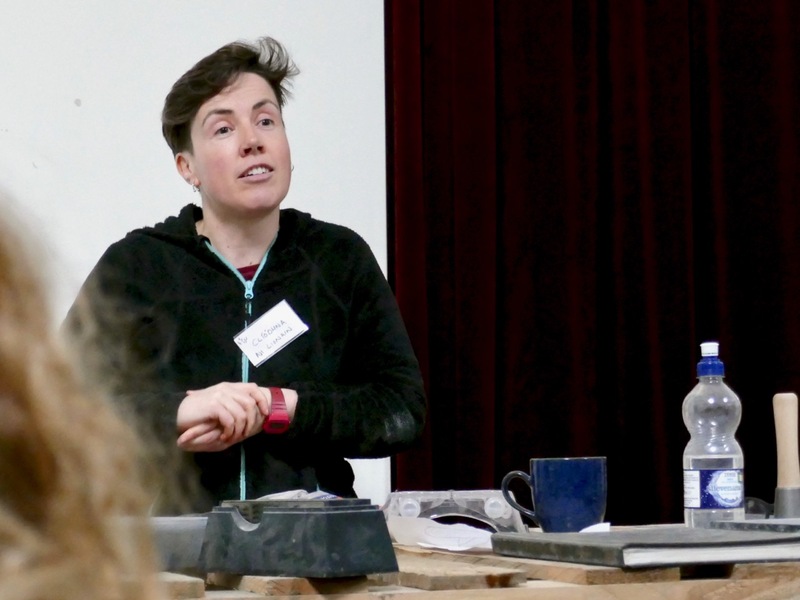 As you know, we are Rock Art addicts, so this week went along to this year’s Stone Symposium in Durrus, West Cork, to hear Cliodhna, above, give a fascinating illustrated talk on the finds at Dowth. Have a look at this post on the inaugural Stone Symposium from 2017. It’s great that the event is thriving and attracting interest and participants from far and wide. Our attendance at the Symposium set me thinking about the whole subject of stone. It’s the most basic of creative materials, as relevant today in construction and art as it was to our Neolithic ancestors. 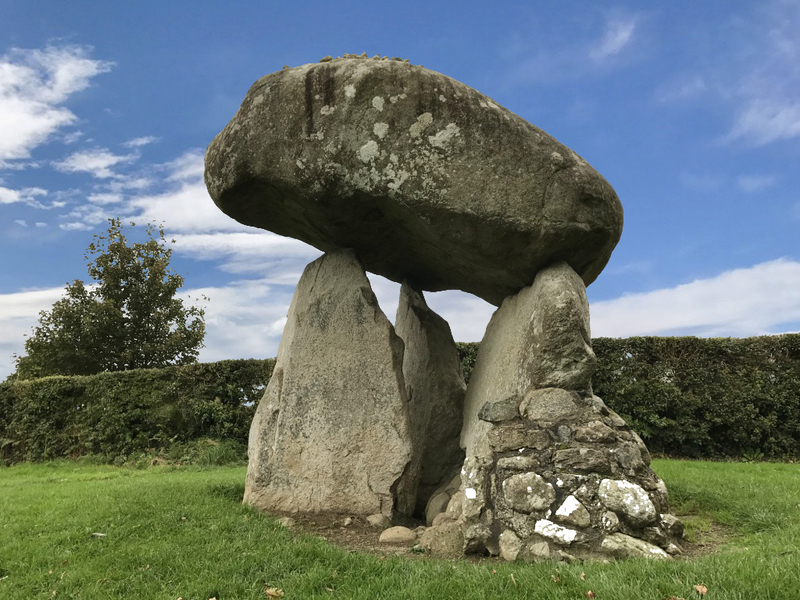 Proleek Dolmen in County Louth (above) is an example of the early use of stone to create a structure which made a huge impact on the landscape. It’s a portal tomb over 3 metres high, and the supporting stones are around 2 metres high: the capstone is estimated to weigh 35 tons. It’s probably a more visually impressive structure today – in its ‘naked’ state – than it was when completed, as it is likely to have been covered over with a mound of earth and / or stones. 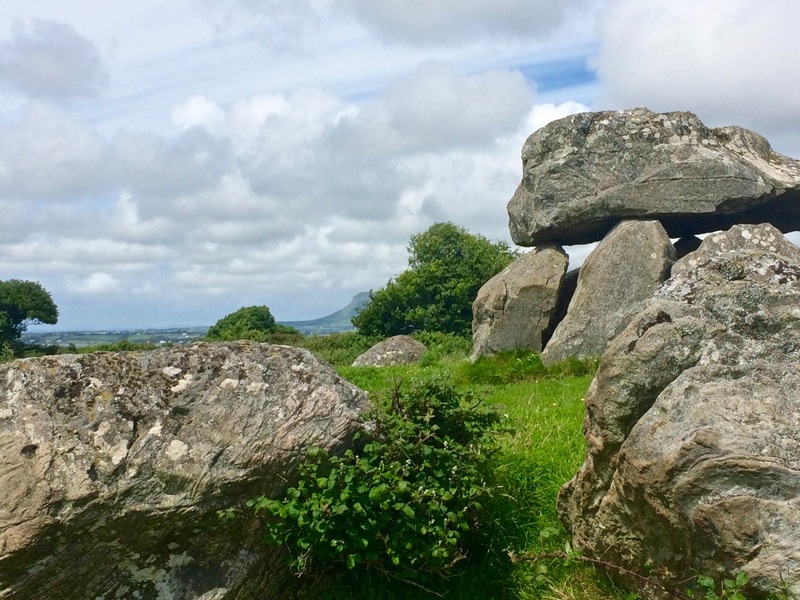 There is folklore attached to this monument: it is known locally as the Giant’s Load, having been carried to Ireland by a Scottish giant named Parrah Boug McShagean, who is said to be buried in the tomb or nearby. …As do all the other stone monuments which celebrate their makers – although perhaps they remain enigmatic to us today. Bronze Age stone circles have always fascinated, and at least we know that they have orientations which must have been significant. 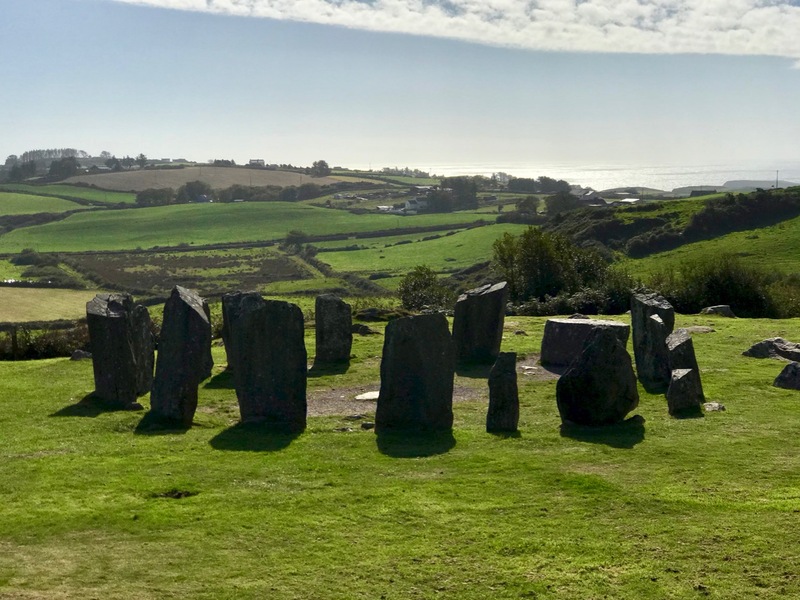 Drombeg in West Cork (above) is much visited at the winter solstice, when the path of the setting sun falls over the recumbent stone when observed through the two portal stones at the east side of the circle. I am strongly inclined to believe that it may be even more ancient than the period assigned for the conversion of the Irish generally by their great apostle Patrick . 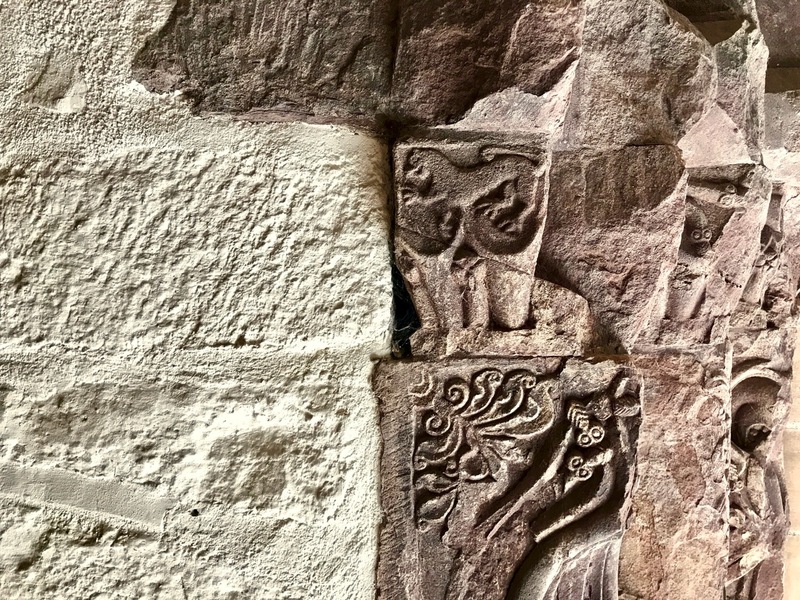 . .
It’s a fascinating discussion to follow – Peter Harbison sets it out in detail here, and concludes that the Oratory could have been built as late as the 12th century, even after the great Romanesque flowering which included the building of monastic settlements and round towers. 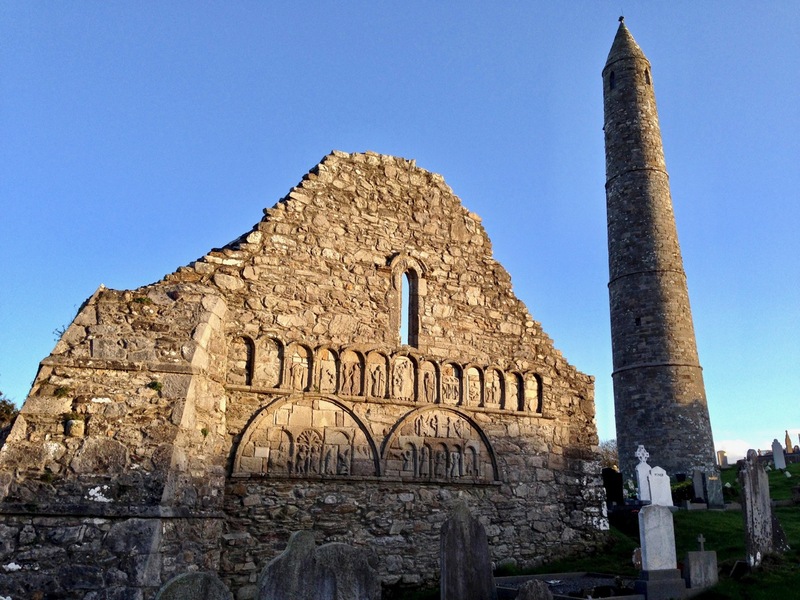 The 12th century cathedral and (possibly earlier) round tower at Ardmore, County Waterford (above), should be a Mecca for stone enthusiasts because of its monumental architecture and carvings: St Declan founded the site in the 5th century, and his monastic cell survives. 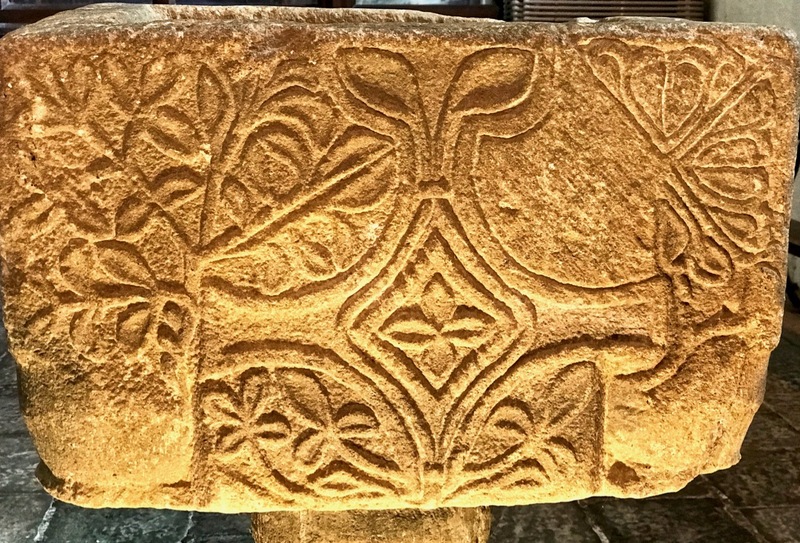 The Romanesque period in Ireland has many other examples of stone craftsmanship to show, proving that working with stone had become a high art in those medieval times. 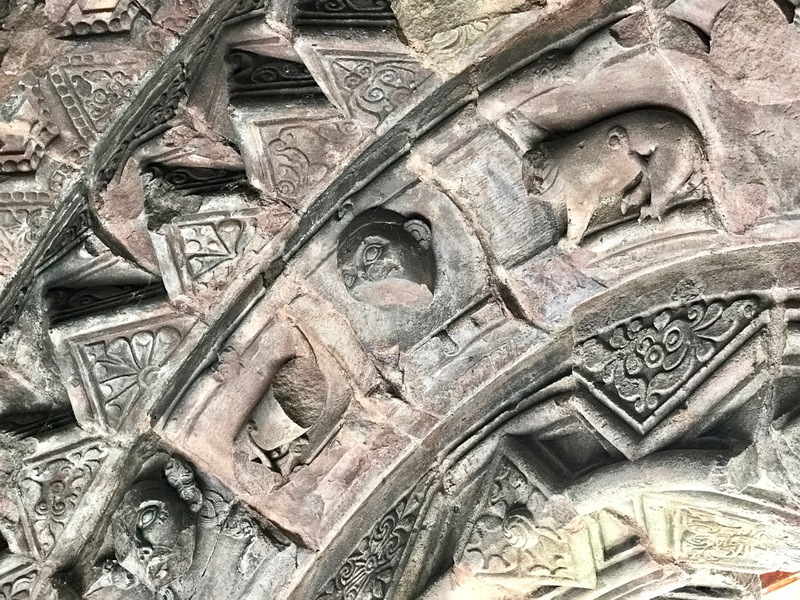 The examples below are from Killaloe Cathedral in County Clare. 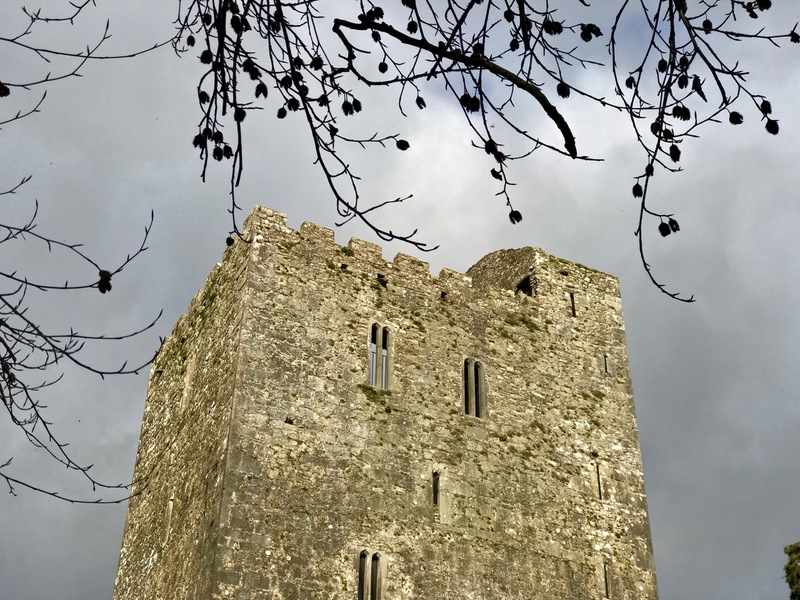 One of the finest Romanesque sites is the Rock of Cashel in County Tipperary. Finola has written in detail on this architectural gem here and here. 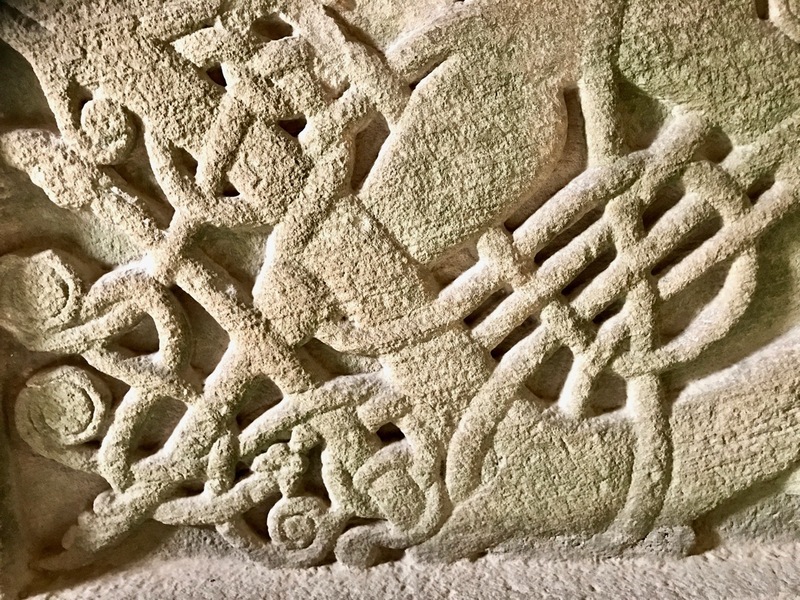 Suffice it for me to illustrate only one of its treasures – Cormac’s tomb, a sarcophagus beautifully carved in the ‘Urnes’ style – a Scandinavian tradition of intertwined animals. 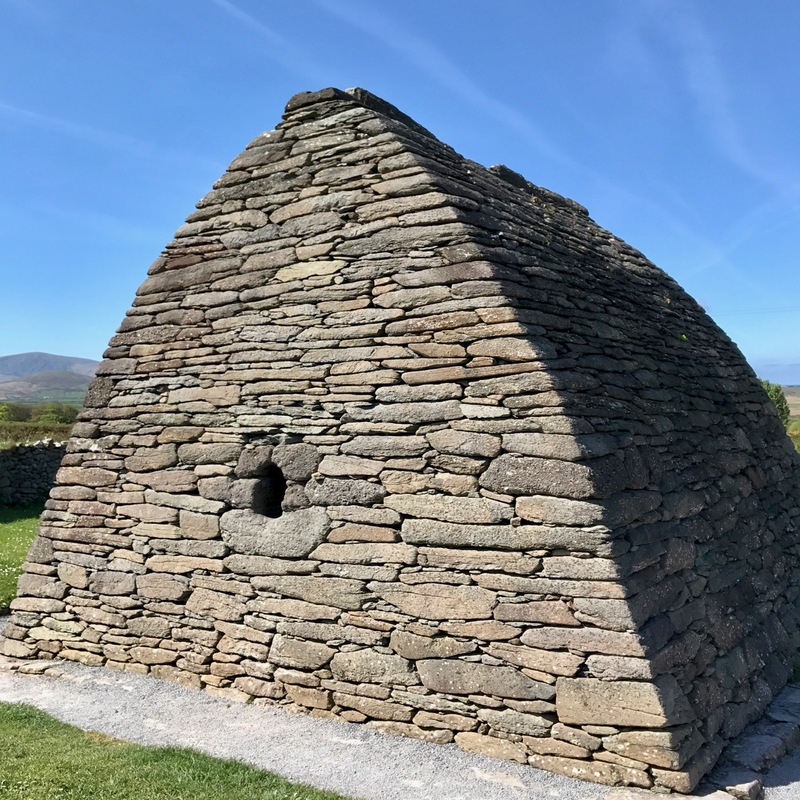 For centuries, stone has also been a ubiquitous utilitarian building material all over Ireland. 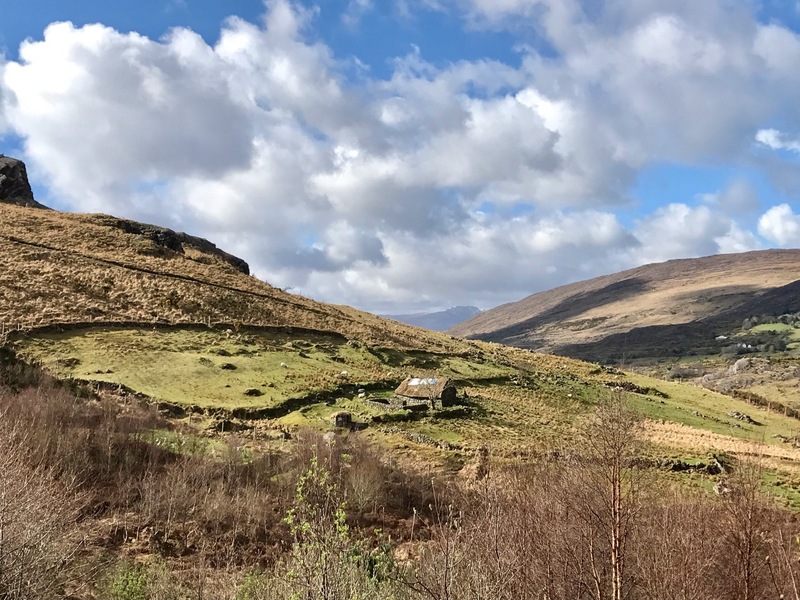 ‘Castles’ or – more properly ‘Tower Houses’ – date from roughly 1400 to around 1650, and many remain in a ruined condition, particularly on the coastline of West Cork: we can see five of them from Nead an Iolair. Some have been restored in modern times, including Jeremy Irons’ Kilcoe Castle. The example below is from Conna, East Cork. 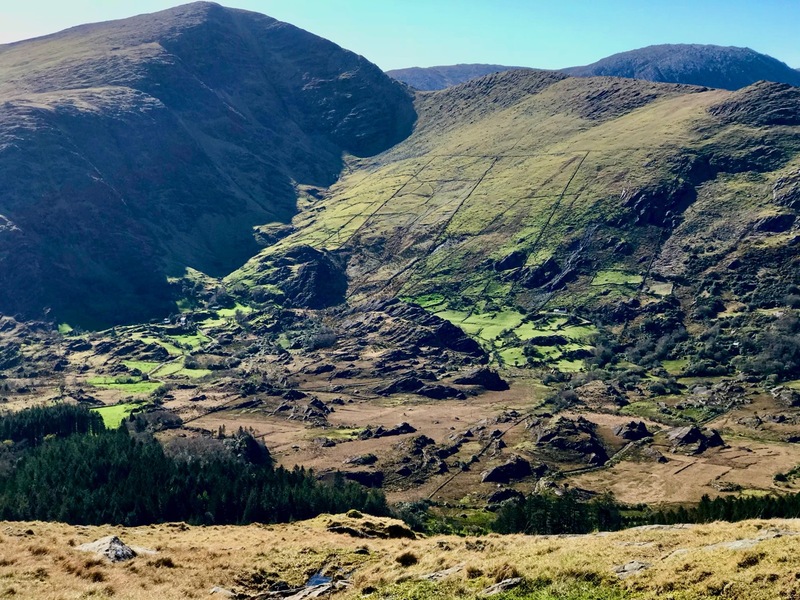 Ireland’s landscape is sculpted from stone. Drystone walling is an ancient tradition still practiced for dividing up land, and varies considerably in style regionally, reflecting the differing geology across the island. Two examples from the Beara Peninsula (below) show the essential geometry of field patterns which stone wall building has created over the centuries. Stone has also long been a medium for communication. 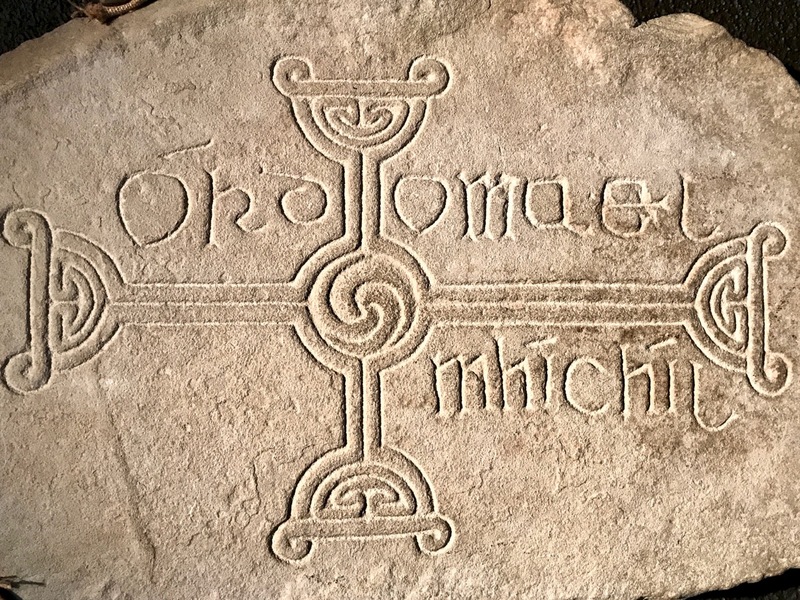 We have commemorated our ancestors for centuries with grave markers, often with elegantly carved lettering. 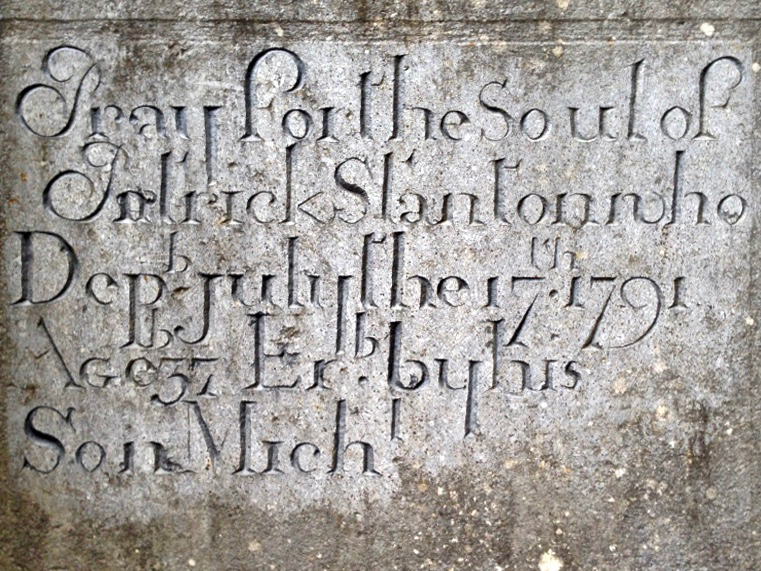 Of the two examples below, the first is from Clonmacnoise, and is likely to be early medieval, while the second is an inscription from 1791. This is just a brief history of our use of stone, dating over thousands of years: I have chosen many examples – almost at random – but hope that I have demonstrated how important it is to continue this ancient craft. 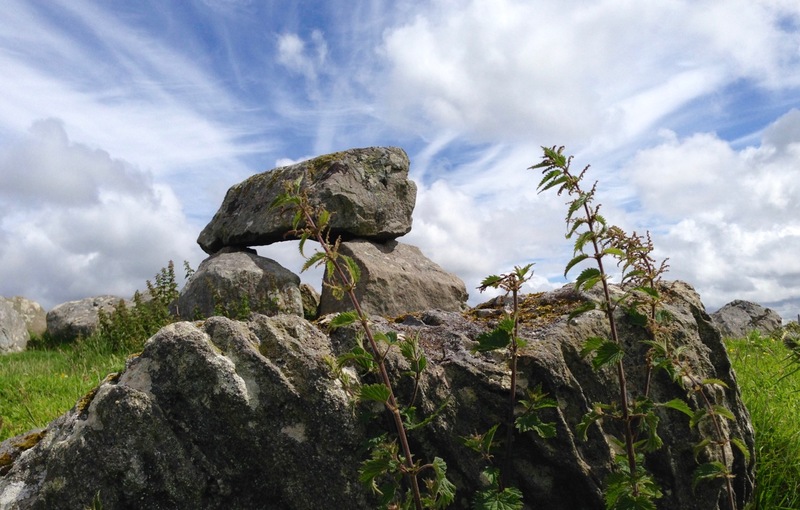 The West Cork Stone Symposium is doing sterling work in promoting it today: long may this continue! 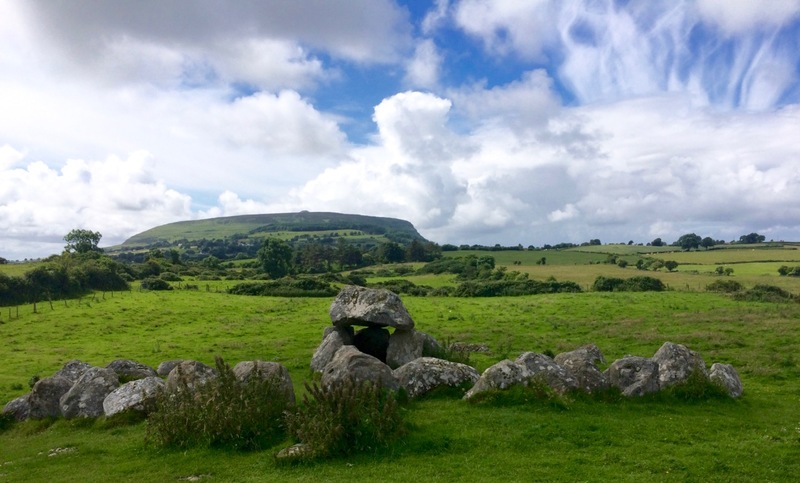 At the heart of the Coolrea peninsula in County Sligo lies one of the greatest megalithic complexes of ancient Ireland, An Cheathrú Mhór or Carrowmore as we call it today: the Irish name means ‘The Great Quarter’. Spread over a plateau of some 150 acres and centred on the high point of Listoghil are thirty recognisable tomb sites but it is suggested that there were once at least a hundred monuments here. The changing landscape has taken its toll: from the 18th century onwards land clearance and quarrying have damaged and obliterated many of the remains and even as recently as 1983 Sligo County Council sought to place a municipal landfill dump adjacent to the known sites. Fortunately a few alert local residents objected and took the case to the High Court in Dublin. Initially their objections were overruled but in 1989 an appeal to the Supreme Court was successful and the very important landscape context of Carrowmore has been saved, hopefully for all time. In that same year the state commenced purchase of a part of the site and has developed a sensitively planned visitor facility now run by the Office of Public Works. Since then more of the surrounding site has been purchased and is in public ownership. It’s the integrity of the complex that is so special here. 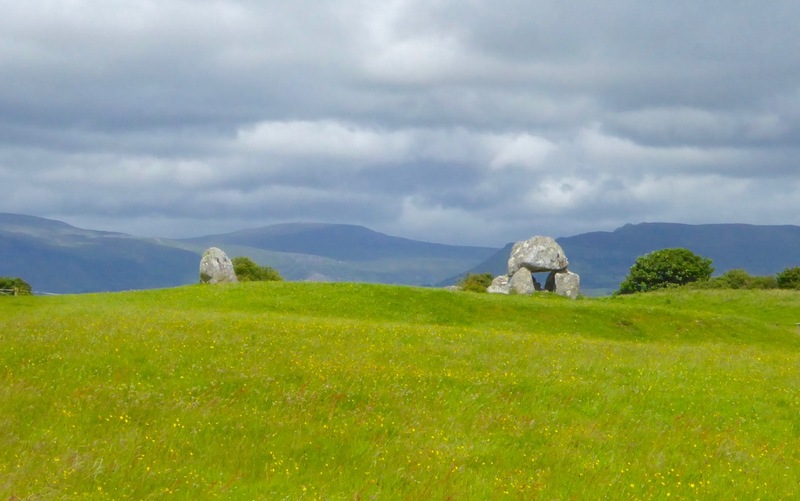 The monuments found at Carrowmore are called boulder circles, though several have central dolmens or rudimentary passages. Generally around 12 to 15 metres in diameter, the circles contain 30 to 40 boulders, usually of gneiss, the material of choice for the tombs. Sometimes an inner boulder circle is also present.They are considered to be an early type of chambered cairn, or passage grave, though in fact, they may be the ancestor of a few monument types. This is the view of local man Martin Byrne, historian, artist, musician and our tour guide for the day. He pointed out to us how the passage of each of the boulder groupings is oriented, not towards a solar or calendrical event but to Listoghil, where an enormous cairn encloses a box-like stone chamber with a large capstone. It’s startling to discover that the Carrowmore complex could be over 6,000 years old: carbon dating from some of the finds has suggested this. If so, then it’s the earliest of the passage grave cemeteries in use in Ireland. Many cremated remains have been found over this site (spread over a long period of time), although unburnt human bones were also recovered in the Listoghil chamber. It could be speculated that the focal point of Listoghil must have been the resting place of a very important person – or dynasty; we will never know for sure. 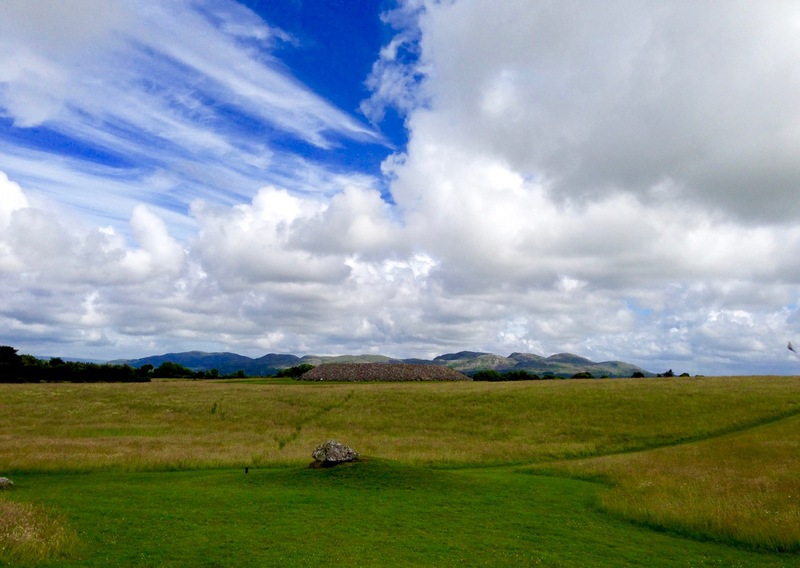 The Carrowmore complex has been visible enough historically to attract the attention of antiquarians – which is useful for later archaeologists, as some parts which are now lost have been historically recorded, albeit using methodology which would nowadays be considered inadequate. Gabriel Beranger, who was born in Rotterdam in 1725, settled in Dublin in 1760 and was a notable illustrator of antiquities in Ireland during a long lifetime; he visited and recorded Carrowmore. A local landlord, Roger Walker, carried out some excavations of the tombs in the 19th century but made no significant records; it is suggested that he was a treasure hunter. George Petrie surveyed the site and numbered the tombs in 1837 but it was another 50 years before archaeologist William Gregory Wood-Martin made the first methodically recorded excavations. William Wakeman produced some exquisite watercolour sketches in 1879. 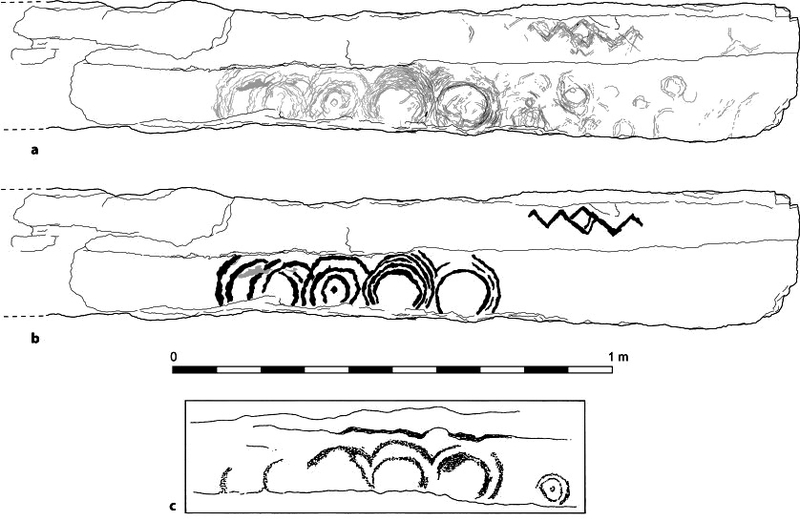 More recently Swedish archaeologist Göran Burenhult undertook detailed studies between 1977-1982 and 1994-1998 and this work included the excavation and subsequent reconstruction of the Listoghil cairn. Our guide Martin has studied the complexes at both Carrowmore and Carrowkeel (a future destination for us) for many years and is imbued with the archaeology and the landscape. 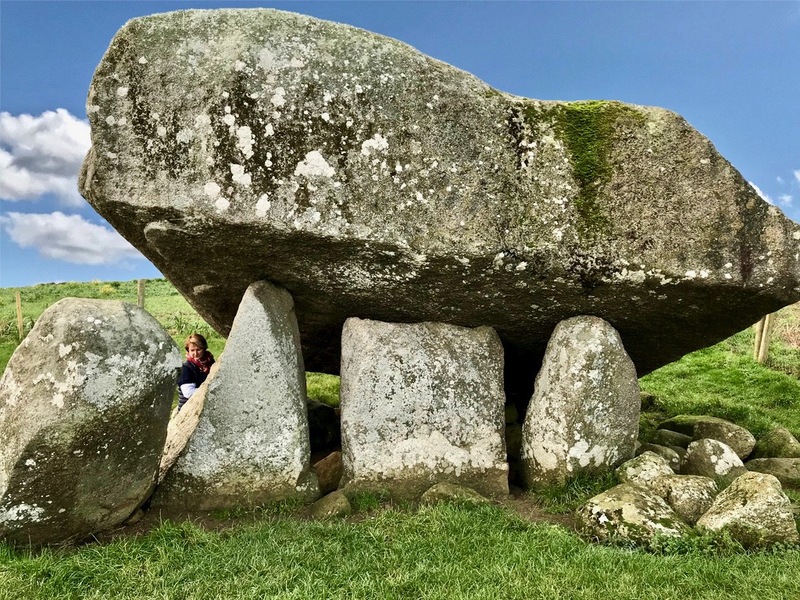 He gently pointed us to the fact that relationships can perhaps be seen between the profiles of some of the boulders – particularly the capstones of the tombs – and the more distant landscape. I find this fascinating: I have always felt, as an architect, that there should be a conscious designed relationship between any building that is erected by human endeavour and the setting of that building within nature. Could these parallels that we might be seeing at Carrowmore be conscious? 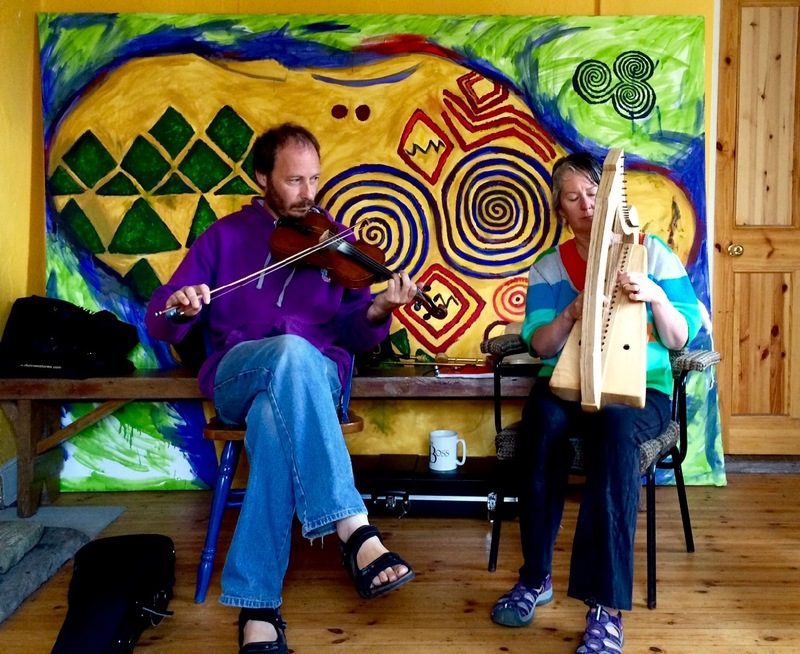 My day was made when I discovered that Martin was a musician – as is Margaret, and I joined them in their colourful house for a little session!